This story is so preposterous it might make you laugh out loud! That's what happened to me. It reminded me of how, when my daughter was little, sometimes a ridiculous thing would strike us funny and we'd laugh hysterically together. From the acclaimed author-illustrator of There’s a Giraffe in My Soup, Ross Burach, comes a curious tale about finding one’s courage and standing up for oneself. Full of vibrant and playful illustrations and hilariously absurd logic, kids will want to read it again and again. 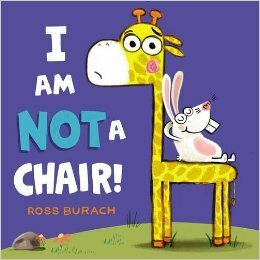 I Am Not a Chair was written and illustrated by Ross Burach. It was published in 2017 by HarperCollins. This is a great book to study if you are learning about plot – the main character makes several attempts to solve his problem and there’s a fun twist at the end when the character finally does take the step that solves the problem. It’s also a great one to study for humor and pacing. I loved the personality of the main character . The text and illustrations worked together so well to tell the story. And then there was a deeper layer with a theme about speaking up for yourself. I think this book has many of the elements of a perfect picture book. I thought this book would be too silly for me, but I was wrong. I really liked the underlying theme about speaking up for yourself. The way it’s done with animals is quite clever. The character of the giraffe really captures how a quieter, shy or nervous child feels, to the point of being nervous even about asking to go to the bathroom. I liked the line: “I need to be me.” Lots of discussion possibilities for young children. Of course, giraffes don’t live in jungles—but then they aren’t used as chairs, either. Think of a time when you felt afraid but couldn’t speak up for yourself. How did you feel? Draw a picture or share in a discussion if you wish. If there was another page to the story, what do you think the turtle would do or say? Draw your idea! What is your favourite page in the story? Why? The cover draws you to the story with the look in Giraffe's eyes. When you are new and very shy it can be so scary to find and use your voice. What a helpful and fun book to read with kids. For children, learning how to speak up for themselves is a skill they all need to learn. Back when my daughter was in kindergarten, she was injured intentionally by a boy. I went with her to see the principal, but I first asked her a few questions about the incident to help her know what to say at the meeting. She told the principal what happened, how it made her feel, and what she expected the principal to do to right the wrong. From then on, she's been able to take care of most of her problems. I think this is a book that should be on every classroom shelf. Thank you for sharing this book. What a great way to handle the situation! It's so true that it can be hard for young children to speak up for themselves. The copy I read was borrowed from the library, but I'd like to get one for my class. Very cute! I've felt much like a shelf as a parent! Haha! I didn't think of that! How true. Fun story. I too laughed out loud in the bookstore. Great trailer, I especially love the narrator's voice! definitely HAVE to read this!